Up until 1986, Star-Telegram Publisher Phil Meek had imposed a moratorium on StarText press releases and conference appearances by staffers. We were in "protective custody" of sorts. For good reasons. Online at the time (much like today, actually) was inspiring waves of crazy spending and even crazier investing. We were having more success with our measured, home-grown, low-cost approach than Viewtron was with their glitzy, high stakes, high-dollar strategy (In point of fact, Viewtron closed its doors in 1986 after less than three years of operation.). But Meek lifted restrictions on both in 1986, and we soon found StarText was in demand for the online conference circuit. 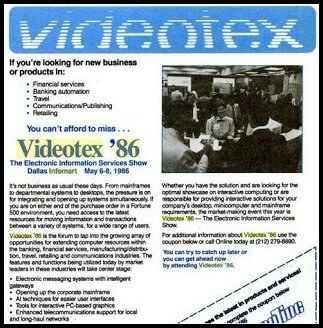 One of the first opportunities that presented itself was "Videotex '86," scheduled for the Dallas Informart May 6-8, 1986. Spread over three days, there were dozens of top-flight speakers and hundreds of participants coming from all corners of the globe. Online veteran Peter Winter, then serving as president of Online International Inc., the conference organizer, wrote that despite "the regrettable closure of two pioneering videotex operations, Gateway and Viewtron" over the past 12 months, "videotex was flourishing." Among the speaker roster were such familiar names as Charles Forbes and Martin Nisenholtz (then with Oglivy and Mather, now senior VP, digital operations, for The New York Times). We were invited to join a panel on consumer services. The question was, who would speak? None of the staff had any real experience speaking in a large, public forum. You are no doubt familiar with the surveys that rank "fear of public speaking" higher than "fear of death." Early on, Joe and I hit the computer club circuit with our dog and pony show. And just about everyone on staff continued to speak at various club and subscriber events. Additionally, I was making numerous appearances in front of educators at schools and libraries as we moved aggressively to get StarText entrenched in schools. At any rate, I drew the assignment. Probably the most interesting thing I remember from that experience was a fellow panelist who went on to make quite a name for himself some years later: Steve Case. At the time, Case was there to talk about Quantum Link, a new service for owners of Commodore computers from a company called Quantum Computer Services. In 1991, Quantum got a new name -- America Online -- and Case became CEO and chairman. You recall AOL merged with Time Warner in 2000 in a $164 billion deal. StarText was also featured in a track on "Video Banking: Entry Options and Strategies." The session was titled, "StarText HomeBanking with Provisional Bill Payment," and the speaker was David Zent. Zent, VP in the Electronic Banking Support Group of InterFirst Services Corp., was instrumental in getting StarText HomeBanking to market (it made its debut in April, 1986 -- more on that in another post). There would be many more conference and speaking opportunities in the years ahead. In retrospect, probably one of the biggest cottage industries spawned by online would be the conference/consulting business.